An impressive collaborative effort between two equally passionate yet distinctive Funeral/Drone bands. 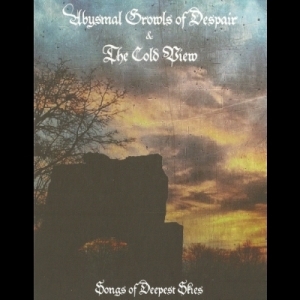 After a short hiatus away from review-writing for the site, it is an absolute delight to commemorate the return to office with an album of such magnitude as 'Songs of Deepest Skies'; a split release marking a collaboration between funeral doom/drone titans Abysmal Growls of Despair (AGOD) and The Cold View (TCV). Respective fans of both bands would be familiar with their commonly-shared motive to divulge pulsating drone-laden textures interspersed with harsh vocal expressions and mammoth atmospherics unique to their respective styles. However, with 'Songs of Deepest Skies', I personally found that both bands have come together to create something new; something different away from their usual routine. One almost gets the feeling that there is a larger agenda taking place here; as if both bands have temporarily placed aside their individual aspirations to address something deeper. This, perhaps, is the primary feeling that encompasses 'Songs of Deepest Skies', a powerful array of reflective sounds prepared by two talented artists coming together to attempt at exposing the divine, or as philosopher J Krishnamurti used to recurrently point to as 'the Immeasurable'. The split kicks off with AGOD, a band that I instantly became a fan of being exposed to them for the first time with 'Dark Days', an album I thoroughly enjoyed and had the privilege of reviewing a few months ago. The band's sound is very much rooted in minimalism, comprised of rumbling drone-laden guitar washes and simplistic yet hypnotic drum patterns, all of which is intelligently interspersed with ethereal soundscape synthesis. The one element that really intrigued me about this band the first time I listened to them was how their music never seemed 'empty' or lacking in any way despite their minimalistic employment of instrumentation. The popular phrase 'Less is More' may very well be attributed to their musical philosophy and approach. However, one element that I did find to be an interesting change of pace on this album was the band's experimentation with clean guitar/bass buildup sequences (present in the middle section of 'Decay of a Man' and opening sequence for 'See the Night'). It's all in the little subtleties; namely string creaks, natural resonance and reverberation that truly draw the listener in ever so intimately whilst simultaneously providing a much-welcomed break of quiet reflection before being drowned again in a brutal assault of mind-melting drone waves. The primary strength of this band lies in its honest and consistent execution in composition, expression and production; that which I personally find to be a noteworthy achievement particularly in an era where honest creativity is sacrificed for subservient conformity more often than not (sadly). Thus, one can fully expect to find the same constituents of AGOD's unique atmospheric-drone blend deployed on 'Songs of Deepest Skies' that would satisfy both existing and new fans, hopefully enticing the latter to explore their expansive discography further. All three contributed tracks are equally recommended, with my personal favourite being 'Decay of a Man'. Things take a much harsher turn upon arrival at the second half of the split, featuring German solo drone-outfit The Cold View (TCV) and their contribution being a singular mammoth 30-minute piece entitled 'Sky of Sorrow'; a very fitting name accurately reflecting the bleak emotional intensity that pervades the entire sonic voyage they have carefully sculpted. Having come across their work for the first time, I would describe their overall sound as raw, dreary and sluggishly-intense doom for the lonesome heart. I personally found the 30-min piece to almost represent a voyage through the depths of the subconscious, an arena well-built by the band's use of coarse noise effects and corrosive atmospheres. TCV's style leans more towards the industrial/experimental realm; thus highly recommended for fans of the said genre;but in addition, integrated intelligently with funeral-paced doom to give birth to the ultimate atmosphere of dread and hopelessness. Shifting our focus towards the track itself, the intro is absolutely brilliant. The patient evolution of clean guitars and mystical atmospherics sets the ideal foundation in preparation for the coming onslaught of radiating distortion, iron-pounding drums (that almost signify a slow call to one's death), and harsh guttural growls in the same vein as their collaborators AGOD. The described funeral onslaught pervades most of the track's duration, however with some interesting twists along the journey. For example, the orchestration of atmospheric splendour around the 20-minute mark serves as a beautiful representation of the album theme, whilst simultaneously providing a much-welcomed break after a very lengthy pilgrimage of sluggish-ridden funeral doom. On that note, the repetitive monotony resultant from such particularly lengthy sections of the track, along with what I personally felt to be over-usage of certain key effects, would form my primary criticisms - minor ones at that. For example, the previously mentioned iron-clad effect of the drums, wonderfully-chilling as they are in their delivery, lose their intended charm and significance after a certain point. However, I do completely acknowledge the challenges involved in maintaining engagement (both for the composer and listener) across any track of such extended lengths, and on that front, I very much applaud TCV for their daring methodology. My overall experience of TCV has left me harbouring much respect for the band's unconventional and uncompromising approach to their music. To sum up, 'Songs of Deepest Skies' marks an impressive collaborative effort between two equally passionate yet distinctive Funeral/Drone bands whom have laid out, with much care, a non-coercive landscape of subjective contemplation for the willing listener to roam the depths of his/her own mind and heart; a boundless path as vast as the mighty sky itself. I would also encourage fans that harbour a preference for physicals to check out the limited edition A5 Digipak on offer that comes in a lovely DVD case packaging; definitely a unique addition that will complement any serious doom-lover's personal collection. Visit the Abysmal Growls Of Despair bandpage.